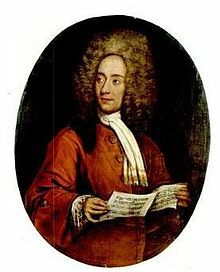 Tomaso Giovanni Albinoni was an Italian Baroque composer. He is almost entirely known today for a piece of music he didn’t actually write: the Adagio in D Minor. The piece was mainly written by Italian musicologist Remo Giazotto, who, after Albinoni’s death, took the small bit that Albinoni wrote and turned it onto the piece that’s so well loved today. Albinoni wrote at least fifty operas, of which twenty-eight were produced in Venice between 1723 and 1740. Albinoni himself claimed 81 operas (naming his second-to-last opera, in the libretto, as his 80th). He is the first Italian known to employ the oboe as a solo instrument in concerti and publish such works, and indeed today he is most noted for his oboe concertos. None of Albinoni’s other known operas, some 50 in all, have survived in complete form. See a list of those. Albinoni’s works number in the hundreds. Access complete list. This entry was posted in Tomaso Albinoni and tagged Tomaso Albinoni. Bookmark the permalink.